Pay Less To Net More! FREE/NO OBLIGATION Pricing study of homes that have sold and that are actively listed for sale which are similar to your home/property to determine a pricing strategy that will maximize your net return. This is a several page report including pictures, descriptions, pricing and so on of comparable homes. It shows a low, average and high pricing range, based on recent similar sales. FOR A FREE NO OBLIGATION REPORT EMAIL ME AT Scott(@)scottgibson.com or call/text me at 480-897-7005. Home Evaluation/Recommendation I will come to your home/property to produce a picture based list of recommendations to improve the value and saleability of your home/property that will help maximize your net return. MLS listing 85% of homes sold are sold through the MLS (Multiple Listing Service). Your home/property will be listed for sale on the MLS and exposed to the largest pool of buyers. Listed on Realtor.com, Zillow.com, Trulia.com, Yahoo.com, and so on. 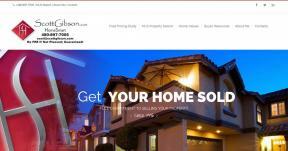 Most all websites that promote or list properties for sale derive their data from the MLS. Up to 50 Photo's Professional photo's taken with a wide-angle lens to promote and best present your home/property on the MLS and internet. Most buyers view pictures of homes on the internet before they ever go to see the home. Lock Box A lockbox will be provided (with your consent) to make your home accessible to Realtor's and their buyer clients. Showing instructions are listed on MLS for Realtor's to follow before showing your home/property; such as "Call Home Owner to schedule a showing". Yard Sign With your consent, a Home Smart Real Estate For Sale sign will be placed in front of your home/property so those who drive by can call for information or scan a barcode on the sign for property information. Feedback As your property is shown the lockbox system will record Realtor contact information so that feedback can be requested of agents to get a better perspective of what needs to be done to get your home/property sold. Receiving Offers As offers are received they will be forwarded to you for your review. I will consult with you regarding the offer and provide a net sheet showing a break down of fees and what your approximate net $ will be. We can discuss your motivation, buyer motivation, and options. Qualifying Buyers Accepting offers from unqualified buyers can lead to frustration and lost time. Qualifying potential buyers to assure that they are qualified to purchase your home is an important step in getting your home closed. Negotiating Determining the motivation of parties and negotiating an agreement that maximizes your net return along with other priorities is considered. Contracting Obtaining signatures, reviewing the contract for accuracy, obtaining broker review and ensuring that the contract is legally binding. Open Escrow/Title Assuring contracts and needed information is received by title along with obtaining an earnest deposit receipt. Inspections Most buyer's hire licensed inspectors to inspect the property thoroughly. As an inspection report and/or Buyer Inspection Notice is presented, it will be forwarded for your review. We can discuss options and motivations, then respond accordingly. Loan Follow Up's During the escrow process it is important to follow up with buyer's agent, lenders and escrow officers to assure that all processes are being completed. Closing Reviewing final balance sheet statements to verify accuracy along with scheduling signing at title company prior to closing. Following up to verify sale has recorded. Arranging for keys etc. to be transferred to the buyer. Removing sign and lockbox. Mind you, I am not a pushy sales guy. I want to work with people who want to work with me. I have found that as I create beneficial and enjoyable business experiences, I end up enjoying and benefiting from them also. My aim is to assist you in Real Estate transactions to get your home/property SOLD or to call a place home. My aim is to provide you with the best possible user-friendly information to make your home buying/selling process enjoyable and efficient. This web page is all about inviting you to contact me for more information, for assistance, to preview properties, or for other Real Estate matters. I have been a Phoenix-area resident since 1968. I have been in Real Estate since 1996 and have sold homes in Phoenix, Tempe, Mesa, Gilbert, Chandler, Maricopa, Queen Creek, Gold Canyon, Apache Junction, Sedona, Laveen, Ahwatukee, Arizona. * 1.5% & 1% fees are listing agent fee's only. A suggested buyer's agent fee is 3% although sellers can offer less. Example; 1.5% listing fee + 3% buyer's agent fee = 4.5% total Realtor fee's.